A heteromorphic younger beckons from the monochrome screen. “Come here, it’s fun,” he said. In that jungle, animals, humans and humanoids are living together. A quiet and different world that somehow seems to be nostalgic. 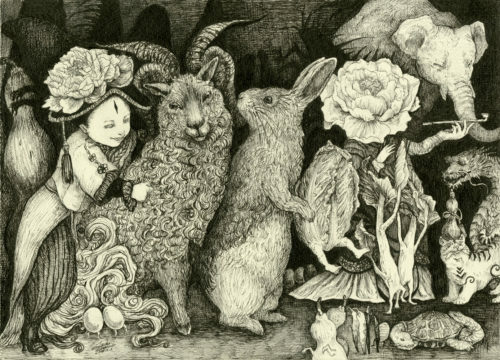 By grease pencils, Kitagawa has described the story of this unique world with an intense expression of black and white contrast. A rich detail gives a strong reality to her world. Reptile women, lion boys and huge frogs play vividly their respective roles there. Foreign objects coexist as they are, she shows us the world of “over there” that may be realized someday. Kitagawa looks very delicate as if it came out from the world. She lives with many animals and plants at home, and works as an staff of a nursing home in the daytime. 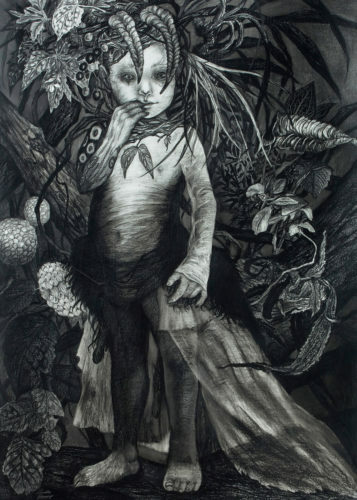 Unique matiere of her works may come from her experience touching of the living things.